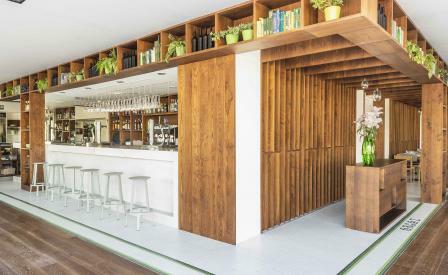 Madrid architects ZooCo Estudio have elevated a simple neighbourhood restaurant in the Spanish capital into a chic destination restaurant for the residents of the affluent Conde Orgaz Park. Owners and local hoteliers José Carlos Monge and Mario del Pino envisioned a modest space that has been expertly upgraded by lead architect Miguel Crespo Picot using rigid, rigorous lines in warm timbers tempered by lush surfaces such as vintage leather, and liberal use of floral and herbal arrangements. The result is a bright, relaxed space perfect for soaking up the region’s rays over a chilled glass of white Rioja, with a patio easily accessibly via a retractable glass façade. A pretty – and no doubt painstakingly installed – mosaic floor helps to keep things cool inside, where guests can join the neighbourhood’s famously Gallic residents for chef José Luis Moreno’s deceptively simple plates of Iberian cooking; dishes such as Galician hake and a timbale of oxtail and potatoes let their superior ingredients shine.